In June, mother tortoise will start doing a lot of digging around. This is typical nesting behavior, we keep a close watch on her activities. In a few days, she started digging a hole for her eggs. This is done with her back feet. She seems to like to dig in the hardest ground she can find. I try to help by loosening up the ground with a screwdriver. She will then show her appreciation by throwing dirt in my face. As she lays an egg, she carefully places it where she wants with her back leg. 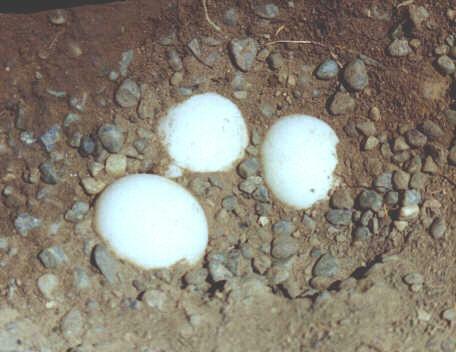 It is common for a few eggs to become cracked in this process either from hitting a small rock or another egg. I have also seen eggs that had pressure fractures that occured inside the female as the eggs were being laid. These eggs would quickly be destroyed in the wild, but if you clean the egg up and apply a good coating of GE Silicone II sealant over the fracture, the egg may be saved. 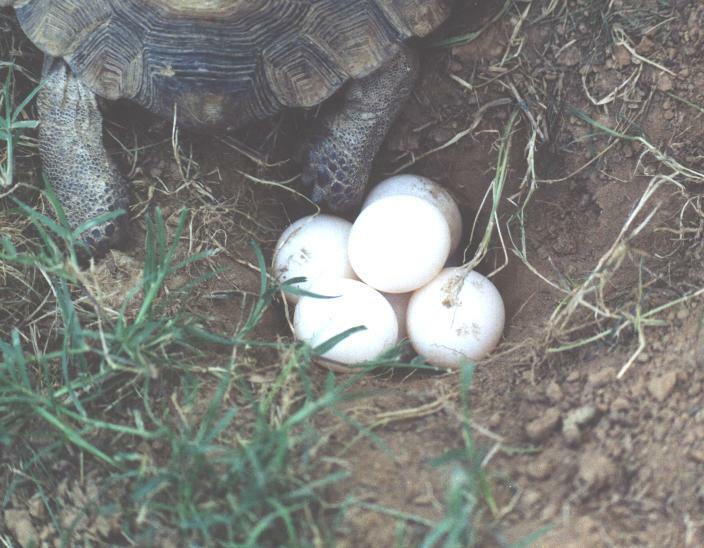 After all 7 or 8 of the eggs were laid, she carefully buries them. I expose the eggs with a spoon and paint brush like an archeologist. As each egg was exposed I marked it with a spot on the top. 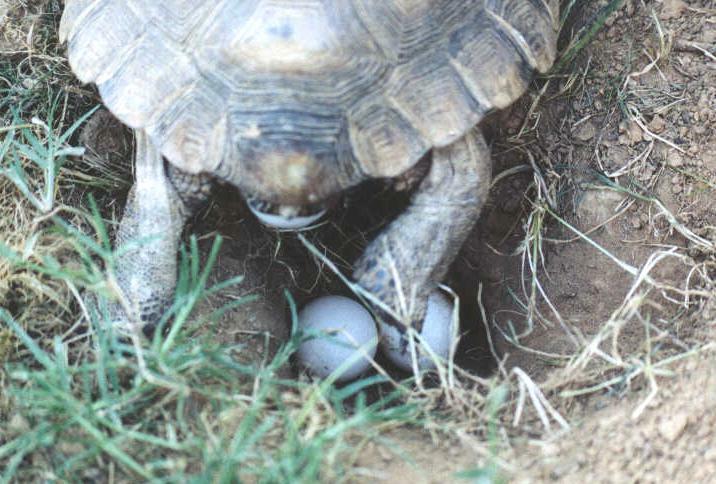 If you turn a tortoise egg after they have been in the ground for a few days, the baby will die. There are no problems if you dig up the eggs soon after laying. The eggs seem to "take a set", change color and establish which end is up. The eggs are transfered to an egg carton and then to the incubator. If I am present at the laying, I have started putting my hand into the hole and catching the eggs as she lays them. This lessens the chance of cracking an egg. If I swipe all the eggs before she tries to bury them, she will continue to feel for them with her back legs and become confused. If I drop some round plastic balls into the hole, she will be satisified and complete her burying. 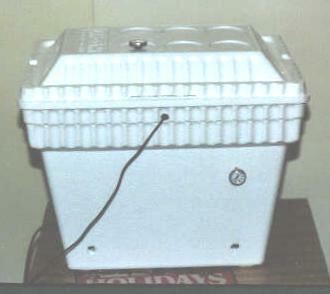 The incubator is made from an ice bucket. A 15 watt light bulb is placed in the bottom and is controlled by a thermostat made for reptile enclosures. Two holes of .5 inch are drilled in the base and 2 more in the lid for ventilation. Thermometers are stuck in to monitor the temperature which was held at 85 degrees. A shelf of perf board was cut to hold the eggs and water. Every other hole was enlarged to .5 inch for better circulation and a handle was installed for removal. 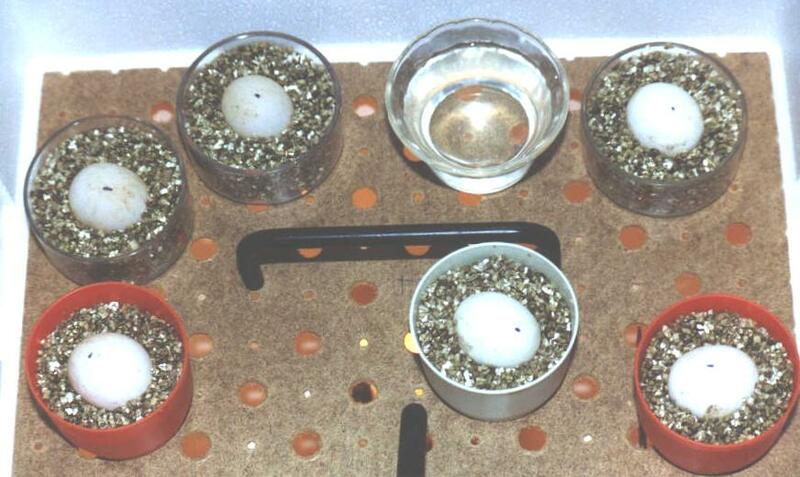 Each egg was placed in its own cup that contained Vermiculite that had been moistened 50/50 by weight with water. 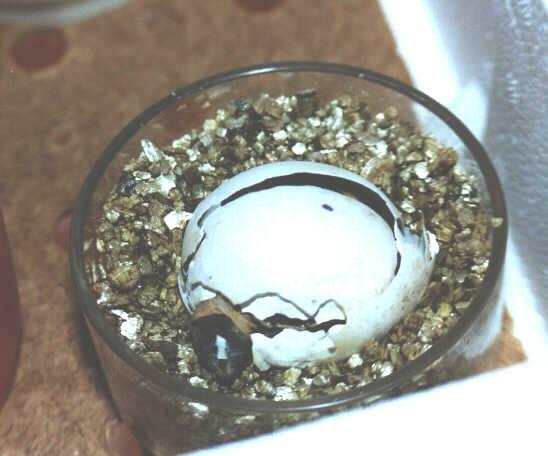 The eggs were placed half way into the Vermiculite. The thermostat sensor is placed at the same height as the eggs as well as the monitoring thermometer. A cup of water was placed with the eggs for humidity. Every 3 or 4 days, I would replentish the water in the cup and add a few drops (4 to 6) to each egg cup. This was dripped around the edge of the cups and not onto the egg. When it became necessary to build a second incubator, the new thermostat didn't control the temperature as closely as the first one. It would swing 3 degrees. This was fixed by moving the sensor below the shelf an inch. This area has wider temperature swings so the thermostat would cycle more often, but the temperature in the upper level would remain within 1 degree. 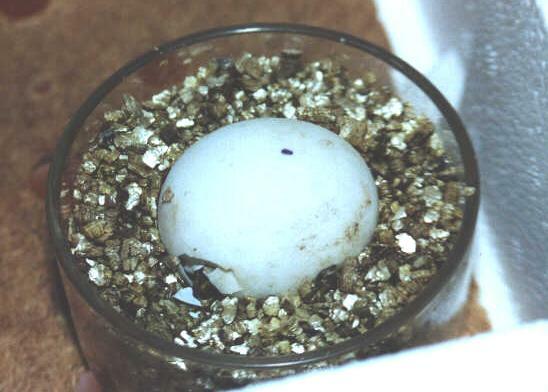 In about 90 days the first egg started to hatch. The baby first sticks its nose out. I believe with this first breathing of air, their lungs start to expand and this breaks the rest of the shell. Its sort of like blowing up a balloon. The baby is folded in its egg with its tail near its nose along the long axis of the egg. The egg will swell and fracture. At this point, we move the baby and its egg into a larger Tupperware container with a paper towel in it. The baby is wet and the egg is sticky and glues the baby to the Vermiculite and pieces of egg shell. Any egg membrane that sticks to the baby may be loosened with warm water and a "Q tip".